New England photographer and educator Bill Marcy has been featured. Dishware in an array of colors is made from recycled glass by Fire & Light. That's the big impression that sticks with you after you visit The Blue Moose, a newish store on High Street that pretty much defies description. Color even comes up in the name of the store, which evokes a blue moon but then twists that suggestion into something completely unexpected: this place is rare, yes, but in a fun, funky way. Where else can you pick up a really nice gift for ten bucks, check out unusual hand-crafted wall art and serving dishes, order custom framing (including in-home consultation, if you wish), buy the cutest toilet brush ever and, after you've made your purchase, enjoy great café fare in the next room while checking your e-mail? This unusual line of containers, crafted from recycled tires, is fashioned in a manner similar to that for goods in leather. Nowhere, as far as I know. And I haven't even mentioned the personable hosts. Co-owners Paul Faust and Ken Flutie make all customers feel as though they arrived as invited guests to their fun but impeccably appointed home. (Which, considering the long hours typically worked by owners of new businesses, might actually be uncomfortably close to the truth.) 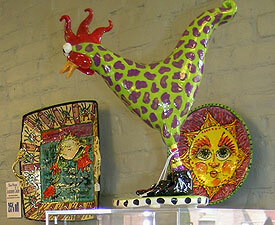 Paul, who began making slip-cast earthenware at age 11 and opened his first retail supply store and art studio at age 16, has been involved with the arts and artists his whole life, while Ken spent 25 years in corporate retail, most recently as a new store coordinator for the retail division of Calvin Klein. Their combined skills -- along with their desire to leave their former home in Florida -- have culminated in The Blue Moose, a venture that came together through a series of serendipitous events. "We always say that we didn't pick Brattleboro," Paul said. "Brattleboro picked us." Though the two wanted to move to the Northeast, they didn't quite feel connected when they visited Brattleboro. But they kept hearing things about our little town on TV, the radio and in magazines, until they just couldn't take it anymore and decided to buy a house in the area. They had a vague notion of starting a store but didn't make any firm plans. "We figured we'd just kind of lounge around for a while," Paul said. But less than a month after they moved, Paul walked through the then-empty space to go to Café Lotus and found himself talking to Lark, the café's owner, about the possibility of moving in. So much for lounging around. Now they just had to decide what kind of store this would be. It didn't take long for things to come together. The focus would be on beautifully designed, functional things in an affordable price range. "Art is really for the people," Paul said. "You can have something hand-crafted and it can be beautiful, and it doesn't have to be expensive." With that basic idea in mind, Paul and Ken started stocking the shop with home and garden items that no one else in Brattleboro was already selling. "When I buy something from a vendor, most of them say, 'Oh, I've never had an account in Vermont before!'" said Paul, who tries hard not to overlap too much with what other shops in town are offering. "It's really about giving people choices." One of the rarer choices The Blue Moose offers is the ability to purchase household goods for everyday use that were not manufactured in China. "We buy from all over the world -- but mainly from the United States, Europe, Scandinavia," Paul pointed out. "There are some things from more obscure places like South Africa, and a few things from China, but we're not using China as the big base." That is unusual in itself, before you even get to the goods. Brightly colored bathroom, kitchen and personal accessories by Koziol, Guzzini, Tissage-Moutet and other European companies are slightly pricier than people might be used to -- but in contrast with the cheaply made counterparts you can get at big box stores, they are beautiful, durable and manufactured by fairly compensated workers. Don't expect Paul or Ken to preach to you about that last part, though. "There is nothing serious about our store at all," Paul says. But when he shows me the Koziol toilet brush, which has a single, large eye on the handle and is slightly reminiscent of that cute little baby alien in the movie "Chicken Little," he does point out one sobering truth: "Everybody hates cleaning the toilet. This makes the bad job a little more enjoyable." Colorful ceramics are a spicy complement to serene stoneware, glass, metal and other materials used in functional and decorative pieces. Other choices The Blue Moose offers: tiny animals carved from wood, a unique collection of refrigerator magnets, a staple-less stapler, bottle stoppers made from sea rocks, inventive candleholder designs for every taste and the most amazing selection of candles and soaps you have ever seen -- without getting knocked into next week by a tsunami of chemical fragrances. 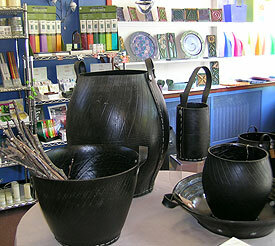 And you won't believe me when I tell you how gorgeous the totes, vessels and soap dishes made from recycled tires are, so don't take my word for it (see photo on page 17). As Paul and I stood admiring them, a respected local potter walked by and commented on how much he loves them; their classic shapes remind him of ancient African pottery, he said. "Recycled can be beautiful," Paul quipped, leading me over to see some attractively textured bowls made of recycled glass in the large room brimming with hand-crafted items -- most of which manage somehow to be funky and elegant at the same time. In many ways, this room is the real heart of the store. With handmade items primarily by U.S. craftspeople (including several local folks), this room showcases a beautiful array of unusual, useful things made of clay, glass, pewter and fiber that you won't really find anywhere else in Brattleboro. Nothing here is mass-produced. Most items are made by individual artists, while a few are crafted by groups of artists working in a small production facility. Paul shows me some colorful bowls by Marge Margulies that, as a nesting set, suggest the layers of a blossoming flower. You can use it as a piece of art, he points out, or you can put popcorn in it. That's The Blue Moose in a nutshell. While you are browsing at The Blue Moose and considering your living space, you might also be thinking about framing a photo, print or painting -- or even about a deeper interior makeover. That's where Crystal Forest Framing and Design comes in. Crystal Forest owner Mindy Urken is available by appointment seven days a week for framing and in-home design consultations. That level of detail is all part of the philosophy too. While The Blue Moose is a fun, friendly place with fun, friendly merchandise, the emphasis is on style rather than fashion. "We try to avoid trends," Paul told me. "We try to pick things that in five to ten years are still going to look good." Without getting too serious here, can you imagine a statement like that coming out of the corporate office at Wal-Mart? This attitude is perhaps my favorite thing about The Blue Moose. If we can bring ourselves to pay a couple more dollars than we're used to for our citrus reamers and candleholders, the stuff we buy is likely to still be around in five to ten years. Not only that, but with our support, The Blue Moose probably will be too. I, for one, sure hope so.